Well, if you really hold your phone as far away as possible from your eyes, then I understand why PPI matters to you. You just said "PPI doesn't matter. Size and Resolution do...."
Thanks @zorxd for mentioning that the total number of pixels or subpixels of the whole display, if you demand to discuss only one measure alone, is a better approximation of the display's characteristics. 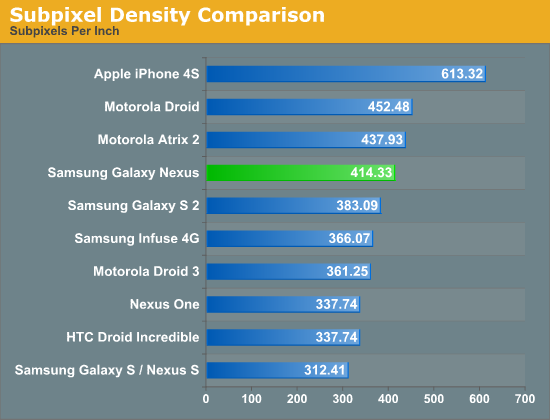 The diagonal alone is 33% bigger on the Galaxy Nexus. These displays are not even in the same class. And it seems really silly that so many respectable tech sites are comparing them as if they are. It's like comparing a 40" to a 53" TV, yet all these tech sites seem obsessed with the pixel density, ignoring the fact that it means little without simultaneously looking at the screen size. Apparently we are as obsessed with technical minutiae as we are with holding our phones way too freaking close to our heads. At least some of us, those who can't see the forest for the trees. 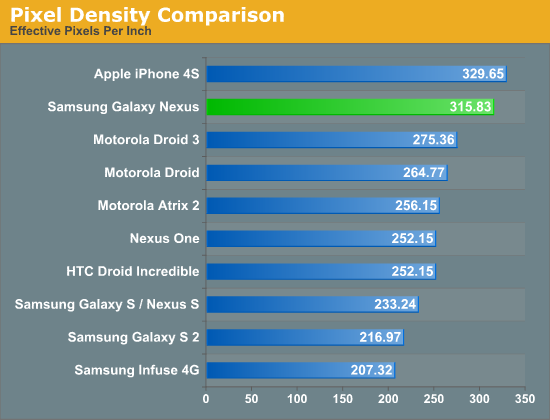 All of this ignores the fact that the contrast ratio for the Galaxy Nexus is 100,000 to 1 compared to the iPhone 4S at 800:1. Again, these screens are not even in the same class. Colors are also more vivid (which I'm sure can be measured), and to balance things out you could have mentioned maximum brightness is sacrificed. You missed the whole printer DPI battle during the 90s didn't you? 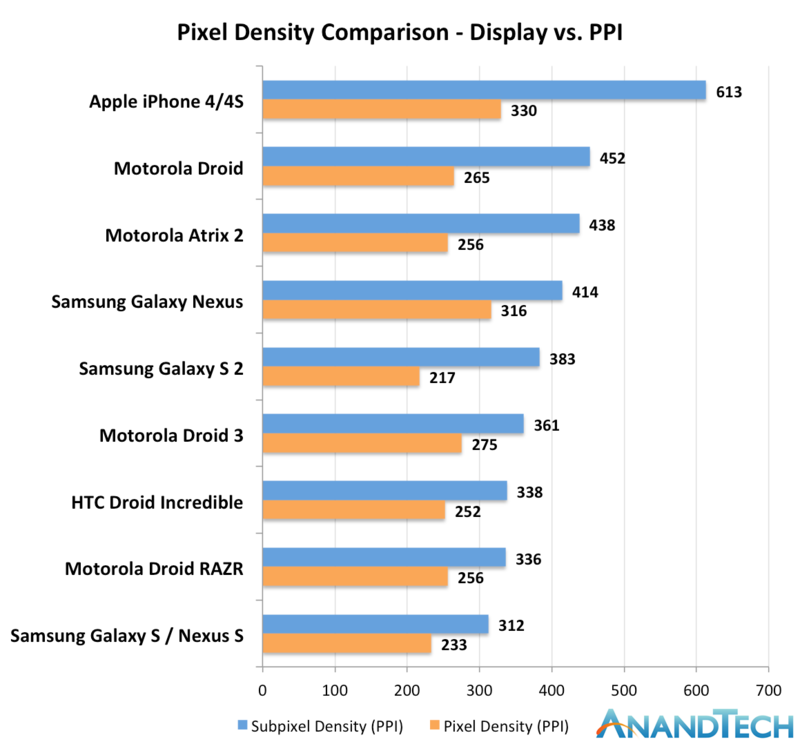 High DPI or in this case PPI is a good thing, but you're measuring it wrong. You want high PPI in X inches, whether X is 3.5", 4.65", 23", then you figure the actual resolution that would be required to make it happen. So using your example a 23" screen at 1920x1080 is roughly 96 PPI. It'd take a 23" display at 5760x3240 to get a PPI of ~287. With resolution independence needed for that sort of high PPI everything would appear razor sharp. Your 300 PPI 1024x768 example would leave you with a 4.25" display which as you said isn't a very useful desktop monitor, but in a phone it'd be great. I agree with you. You always want the highest resolution possible on a given screen size. I prefer a 1280x720 4.65" display over a 800x480 4.65" display. But I don't see the point in comparing the density between screens of different sizes. "Burt I don't see the point in comparing the density between screens of different sizes."